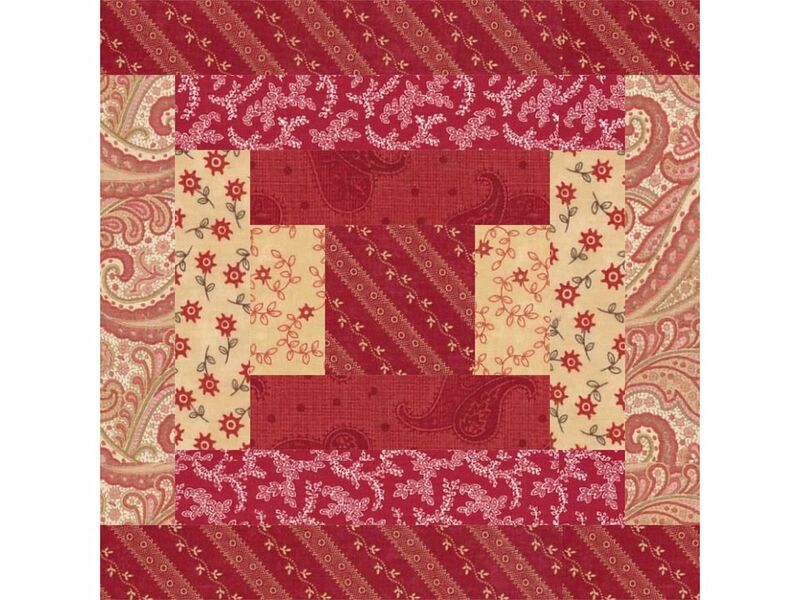 Here's a Courthouse Steps quilt block pattern that finishes at 12" x 12". Courthouse Steps blocks are a variation of the traditional Log Cabin quilt block. The difference? Instead of sewing strips around the block's center in a circular motion, two patches are added to opposite sides of a center square first, and then two patches are sewn to the remaining sides of the center. The same back-and-forth motion continues as the quilt block grows in size. If you aren't familiar with log cabin block assembly, be sure to read my traditional log cabin quilt block pattern before beginning. The tutorial includes ideas for layouts, color choices, and speedier piecing, along with graphics for that version of the block. Take a look at the Log Cabin quilts photo gallery, too, for design ideas and inspiration. In my small quilt, Pitchers for Tildy's Cabin, portions of Courthouse Steps blocks are used to frame on-point quilt blocks sewn with applique pitchers. Remember that the words 'dark' and 'light' are usually different for everyone—one quilter's lightest fabric might be a dark for another layout. Color also controls how visible a fabric is in the design—cool colors often recede and warm colors often 'pop' in the design. Two articles, Color Value Basics, and Color Wheel Simplified will help you choose fabrics. The contrast layout illustrated is not the only choice. Perhaps you would prefer to have lights on three adjacent areas of the quilt block, with only one of the block quarters a darker value. Choose contrast to suit your needs. Use scraps if you like because there's no need to repeat any fabric in a single quilt block. Be sure to sew an accurate quarter inch seam allowance, and have a regular or mini iron nearby to press seam allowances. Use the illustration as a guide to sewing Courthouse Steps quilt blocks or view a larger copy here. All types of log cabin quilt blocks should be pressed after each log is added. Since each pair of two new logs for Courthouse Steps does not touch, it's fine to press seam allowances after both are added to the block—a time saver. Some quilters like to keep a small portable iron near their sewing machines to make pressing a much easier step. Clover's Mini Iron is a favorite because it's tiny and easy to grab without getting up from your chair. Sew a 2" x 3-1/2" light patch #2 to one side of the center square. Sew piece #3, which is the same size and color value, to the opposite side of the center square. Press both seam allowances towards the new strips—continue pressing new seams towards newest strips. Sew dark patches #4 and #5 to opposite sides of the quilt block, positioning them to flow above and below patches #1 through #3. Press seams. Sew light patches #6 and #7 to the block next—refer to the schematic above (click for a larger image). The new patches are adjacent to previous light patches. Press. Continue adding new patches to opposite sides of the block in the same way. Darker #8 and #9 patches are first and are sewn next to previous darker patches. Follow with light patches #10 and #11, and finish with darker patches #12 and #13. One familiar with the technique, cut patches for several quilt blocks and chain piece units for speedy piecing—the technique is explained in the traditional log cabin pattern. You can sew strips on two opposite sides of the growing center before stopping to press. Remember that chain piecing saves time and is a perfect technique to use with log cabin quilt blocks. This article contains an e-commerce link, and we may receive compensation in connection with your purchase of products via the link on this page.